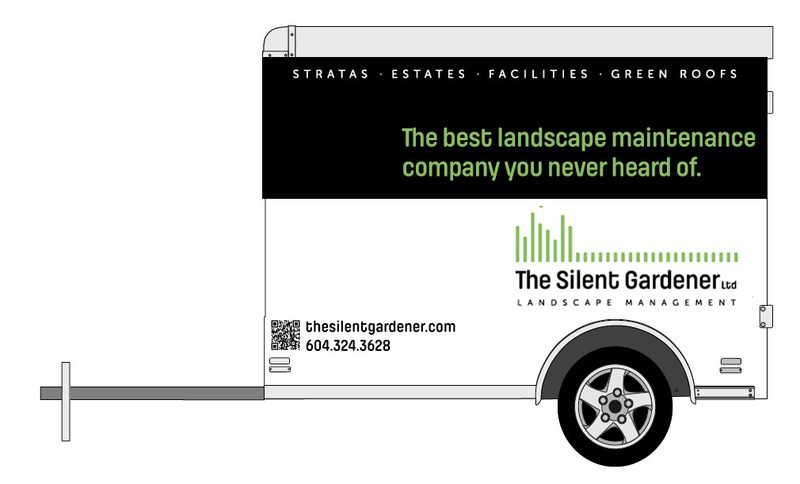 The Silent Gardener is ready to hit the road this spring with a new logo, fresh trailer wraps and electric rider mowers that leave their noisy competitors in the green dust. Ahhh, spring. That season of blossoms and birdsong… the roar of gasoline mowers and the stench of blue smoke in the air. Unless you are a customer of The Silent Gardener Ltd, who for years quietly grew their business using only electric equipment, organic fertilizers and biological pest controls. But as this company’s capacity increased, they suspected their image was not living up to their brand promise. How do you know when this may be happening to you? 1. You no longer really use your marketing material. Old business cards sit unused in a box. Presentation folders gather dust under a desk. You don’t even have a branded email signature. Proposals are created from scratch, as you try to communicate to prospects who you are today. Wouldn’t it be refreshing if your marketing material made a bold promise that you were enthusiastic to live up to? It would certainly be more refreshing for whomever is on the receiving end. 2. You make apologies for your website. It hasn’t been updated in a while. You aren’t that excited to add to it. Or maybe you don’t even have the ability to easily manage your content. It seems like so much has happened since you last told your story, you aren’t even sure where to start. 3. Competitors are getting work you know your firm is more qualified for. It’s frustrating to see business going elsewhere, just because they have a flashier website, slick marketing material or shinier proposals. But can you really blame the client? Who among us hasn’t chosen a product based on its package? Sure, we would like to think our prospects will dig below the superficial to see the real ‘us’ underneath. But why make them go through all that effort? Can’t they expect style AND substance? Let’s get back to The Silent Gardener Ltd as one example. Their old logo featured a friendly ladybug and a warm serif font. It looked professional, but appeared tailored to a smaller-scale residential service. Unicycle Creative took The Silent Gardener Ltd through a Brand Centering process. This led to the insight that they needed to address the (incorrect) perception that they didn’t have the size or horsepower to handle bigger jobs. That called for a bigger, bolder, high-performance look, that still retains a focus on their key benefits of quiet, sustainable, organic service. Their technical green roof expertise also needed to be reflected in this new image. A fresh brand identity was developed, with a more architectural and technical feel. Trailer designs were updated with bold, clean graphics. At the heart of it all, their wit and personality bloomed, in the waveform/grass trimming logo and the writing of the headlines for the trailer and the website. An e-brochure put The Silent Gardener’s larger projects and green roof experience front and center. 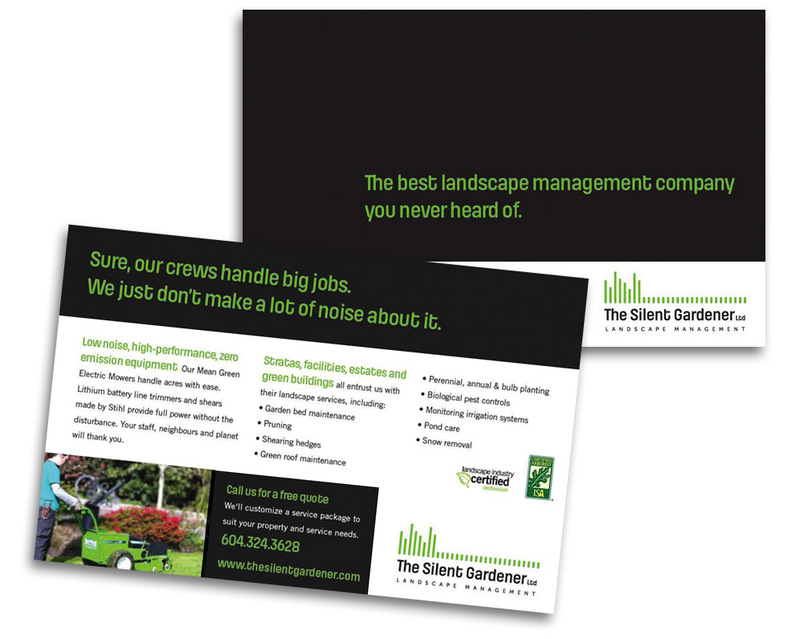 So now it’s on to bigger, bolder projects for The Silent Gardener, energized with a fresh brand outlook. Is it time to take your promise to the next level? Previous: « Telling a sustainability story with a warmer image. Thanks Brent. It’s always nice to have a client with a solid brand concept and an open mind!